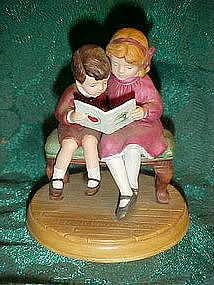 From the 1986 Holiday figurine Series this is "Be Mine, Valentine" by Jessie Wilcox Smith. Made of hand painted fine porcelain and measures 4" tall. Stamped Good Housekeeping 1924 Hearst Corporation and issued by Avon. Perfect condition with No chips or repairs. Two little children sit on a bench as they share a Valentine card. Adorable!